Technically, grilling season starts with Memorial Day weekend, but temperatures here in Dallas have already been mild enough for cooking outdoors. Before you light up your grill for the summer, you need to make sure that you have enough fuel to get you through all the summertime backyard barbecues until Labor Day or beyond. At Northwest Propane Gas Company, we provide new residential propane tanks and propane tank exchange in Dallas for those who use that as their source of fuel for the grill. 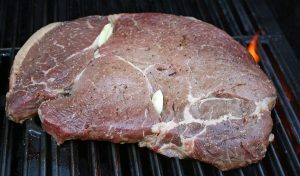 Before checking your propane tank, prepare your grill for cooking. Clean out the inside of the grill and check the gas jets for clogs. Soak the grill grates in soapy water and scrub any built-up food residue off. If the grates are made of cast iron, coat the in vegetable oil on both sides and bake in the oven at 400 degrees F for an hour to season the grates, which makes them non-stick. Replace the grill grates, and check the propane tank. There are several ways to check if you need to replace the propane tank for your grill. Tap the side of the tank. If it sounds hollow, take it to a propane gas tank exchange. Another method is to weigh the tank, and if it feels light in weight, it is time for a replacement. To determine exactly how much propane is in the tank, do the following. Pour heated water over the outside of the tank and look for where the exterior of the tank begins to sweat. This is level of propane that is currently in your tank. Grilling safety starts with a clean grill and tight connections with the gas line and propane tank. If you have a low propane tank on your gas grill, we can exchange it for a new tank that is completely filled with 20 pounds, compared to other companies’ 15 to 17-pound exchange tanks. Call us at Northwest Propane Gas Company at 800-274-6121.